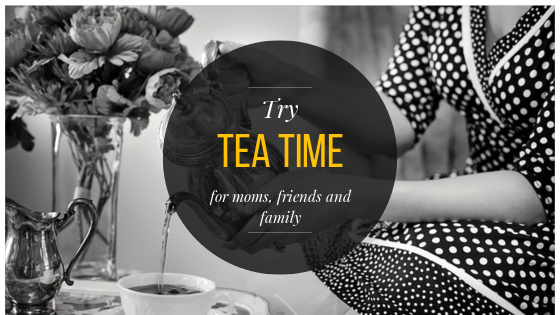 PM Bottom Line: tea with friends (whether or not any of you are moms) is a special way to nurture your community. Try it! What do mothers really want? Sorry, I can’t really tell you definitively. A few years back one mom told me she couldn’t imagine NOT being with her kid on Mother’s Day and that was counter to the whole point. As I snapped out of my breakfast-in-bed followed by silent Spa Day fantasy, I tilted my head to one side and managed to mutter something like, “Oh, OK…”. We all consider celebrating motherhood in different ways, I realized. For me, the occasional break from motherhood helps me stay sane and be present and just plain nicer to my kids when I’m with them. Tablecloths, starched napkins, a “real” table. Card tables are OK! If you’d like to gather your tribe, cultivate your tribe, build your tribe or support your tribe, consider starting a tea group. It’s a great way to build a support system and nourish each other. My current group has women from all different stages of life, but we share church membership, as well as a recent unexpected trial that we’ve helped each other weather. Your tribe could be anything and should contain relationships that benefit you and people you want to get to know better. You can meet for no reason except to visit with each other or you can work around holidays or special occasions. Tea groups are a great way to build community with friends who share similar food values OR share your own food values. Your group can have recipe requirements if you so choose. My group has always kept the requirement simple – something homemade. No stopping at the convenience store on your way over! It’s the bit of thought and preparation that makes gathering for tea so special. planning on about once a month but understanding it will more likely be every 6-8 weeks. Allowing for co-hosting. Sometimes a very small home or a family situation makes it difficult for someone to host in their house. In this case, someone else could host in their home and the other host could do most of the organizing and perhaps provide the tea or setting. I don’t have a tea set, but I do have a lovely and large tea pot. A friend has a set, but no pot. So we have teamed up. Set your “formality” expectations. I’ve been in one group where we did try to dress up a bit. And another where jeans were OK. Both are fine and just dependent on the group. 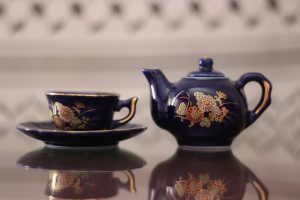 Consider visiting a tea room in town for the tea experience. It’s not cheap, but it gives folks and idea of how tea can be served. It’s also a nice occasional indulgence for the group, as no one has to host. And everything just looks so pretty. Check out a tea shop (or just a tea section of your grocery store) and grab what strikes your fancy. We often try to provide a variety and include non-caffeinated options for anyone who needs that. Give some thought to the savory and sweet ratio. With my current group, we leave this to chance and have so far fared well. You can even look up the traditional courses, serving order and suggested dishes, if you like. The beauty of tea is that it is an affordable way to gather in a special setting and focus on each other and your relationships. There is no music, there are no screens, there are no children- the only distraction is that of tasty treats and flavorful tea. You put your love and appreciation for these friends into what you prepare and nourish each other in so many ways. Whether you have children of your own or not, we all deserve a break from life’s stresses to receive such nourishment. If you do have children in any way shape or form, Happy Mother’s Day!